The WWF-SIGHT team was invited to take part in the Africa Ecological Futures (AEF) II workshop in Nairobi, between the 26-27 of June 2018. 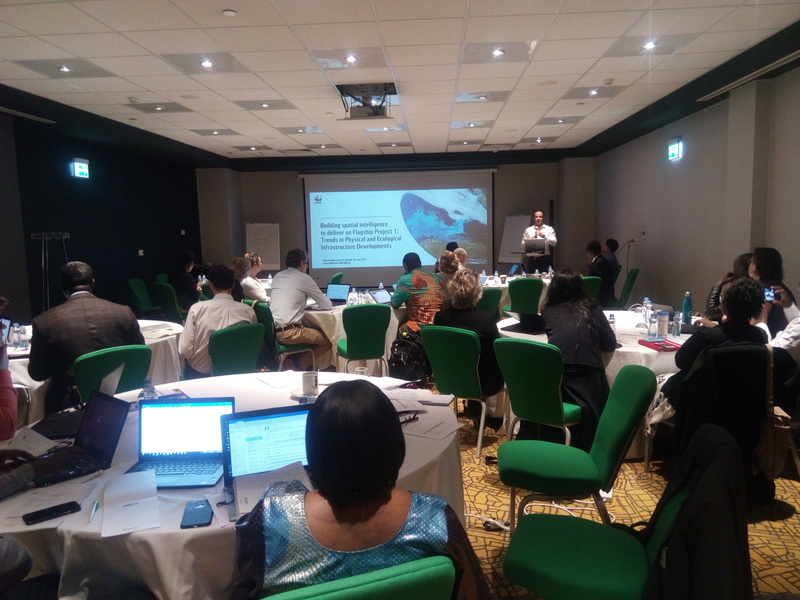 The main objectives of the workshop was to agree on a framework document, identify gaps, confirm partnerships and agree on a implementation programme for the next six month that will lay the foundation for the full implementation of AEF II in the first quarter of 2019. Paolo Tibaldeschi presented WWF-SIGHT and how it could support the AEF II design and implementation; especially on the Flagship project 1 around the trends of physical and ecological infrastructure developments. WWF-SIGHT has the relevant data, tools and expertise to support flagship project 1 in assessing the environmental risks of current and planned infrastructure projects against ecological assets, both at Africa level and landscape level. WWF-SIGHT expertise could also allow to trace investments of these high risk infrastructure projects. Finally, AEF II could use WWF-SIGHT Analytics to develop key indices to measure and report on ecological-physical infrastructure trends by countries. Key participants and organisations from various sectors participated in the workshop including YMCA Africa Alliance, the Africa Development Bank (ADB), Conservation International Africa, The Council for Scientific and Industrial Research (CSIR), UNEP-WCMC and other institutions. The main sector which was discussed was infrastructure given it is agreed in AEF I as one of the back bone for development in Africa and one of the main drivers of potential environmental degradation. Overall the workshop was fruitful in discussing a common vision for Africa which integrates natural resource management, youth, development, and more. WWF-SIGHT team remains committed to collaborate with partners in the development of the AEF II process.